Small forest birds are indicator species of habitat health. These birds need a variety of food ranging from nectar and grass seeds to insects. Most importantly they need vegetation that provides safety for feed and nesting. 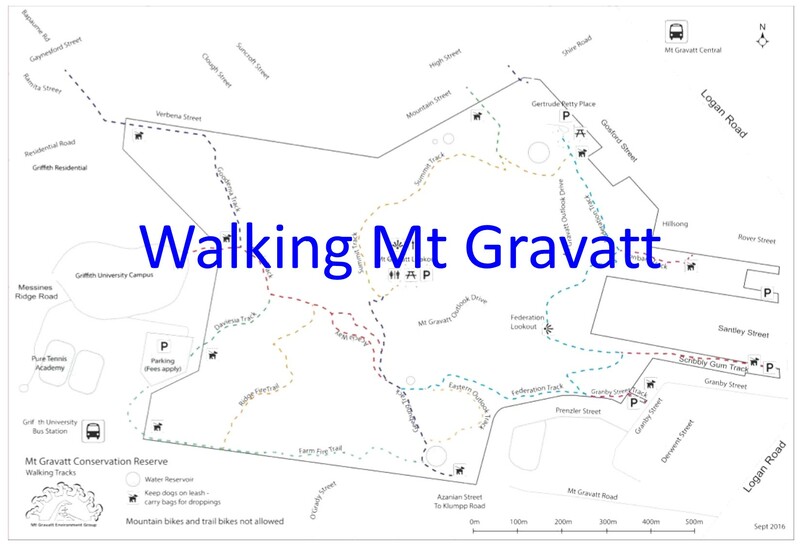 A healthy habitat with a diversity of plant species including canopy trees, shrubs, herbs, grasses and vines flowering at different times provide nectar, grasses provide seeds and a variety of plants attract a variety of butterflies, moths, bees and other insects for insect eaters. 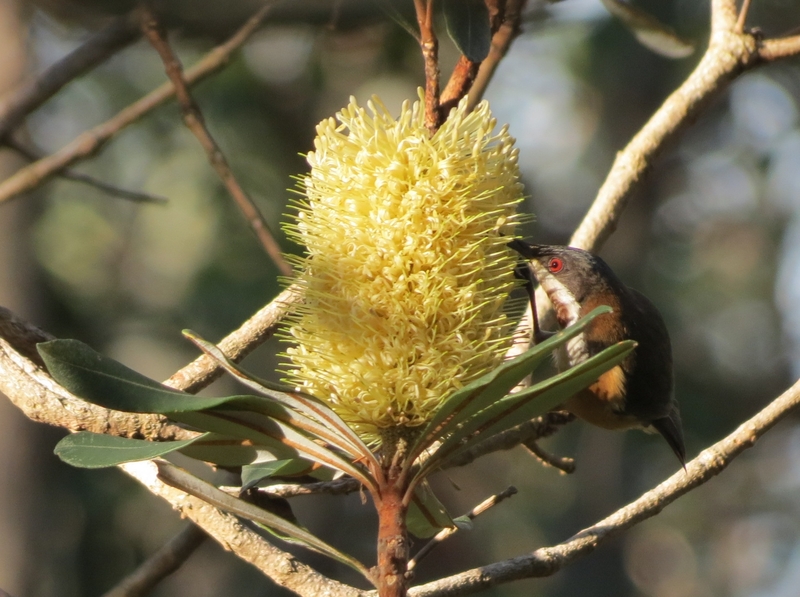 The Eastern Spinebill’s Acanthorhynchus tenuirostris long thin bill enables it to probe flowers for nectar at the same time collecting pollen on the crown of its head which is transferred to the next flower visited. Insects are caught on the wing with agile flight manoeuvres. Breeding between August to March when the female builds a small cup shaped nest of twigs and grasses bound together with spider web 1 to 5 metres above ground. Listen for their short high pitched piping song. 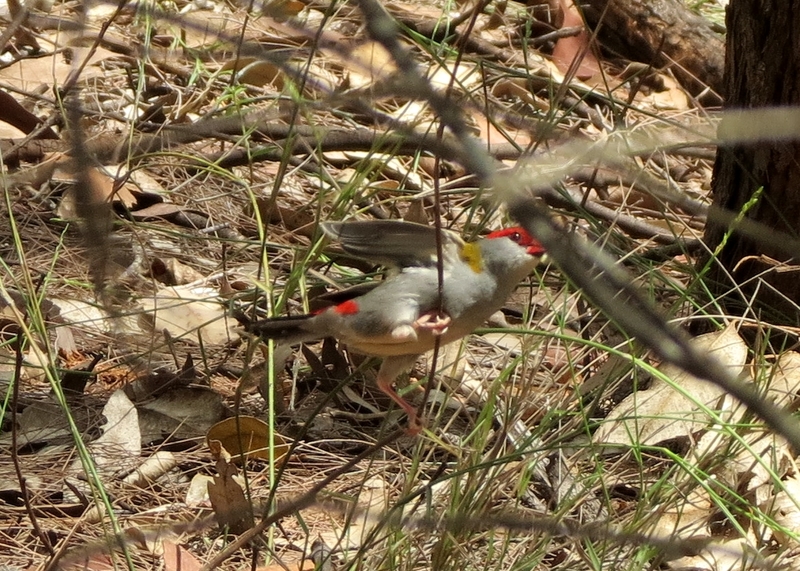 The Red-browed Finch or Red-browed Firetail Neochmia temporalis specialises in eating seeds and small insects. Only eleven centimeters these small birds may be seen in flocks feeding on the ground near dense undergrowth where they will escape if disturbed. Red-browed Finches are recognised by their bright red eyebrow, rump and beak. Wings and body are olive-green and grey. Call is a short pitched whistle. Breeding between October and April males and females work together on nest building. A ball of woven grass and twigs with side entry is built 1 to 2 metres above ground. A clutch of four to five eggs are incubated by both parents. Variegated Fairy Wrens Malurus lamberti are a social species living in groups of a dominant male and female couple with other non-breeding and younger birds. Breeding males have bright blue features while females and non-breeding males are brownish-grey. 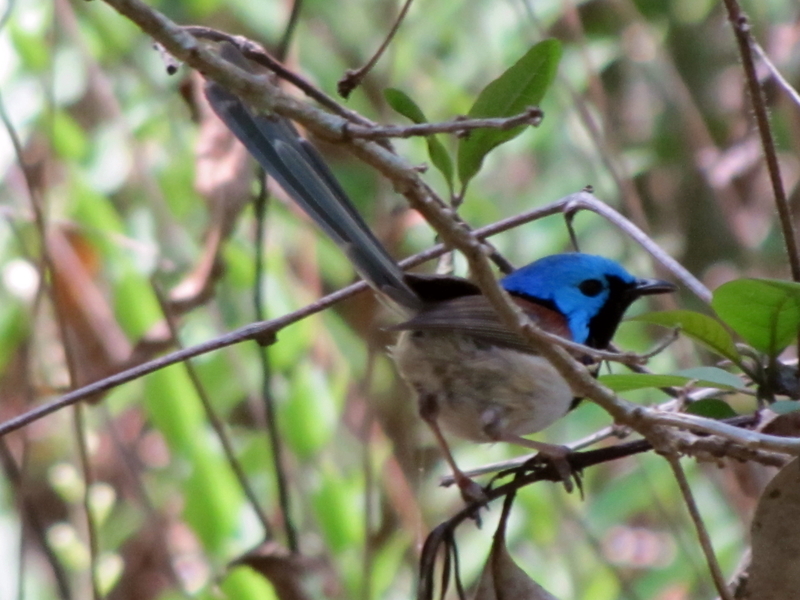 Variegated Fairy Wrens feed on insects searching around at the base of shrubs and sometimes among the bark and leaves. Only thirteen centimeters these shy birds rarely leave the safety of their preferred thick shrubby habitat. The prickly invasive weed Lantana camara is often home to these small birds. Bush restoration work will often leave Lantana in place until replacement habitat has grown. The dominant female constructs the nest – a ball of woven grass held together with spider web. The female incubates the eggs then the whole group help with feeding the chicks. Grey Fantails Rhipidura albiscapa are often noticed performing on a branch with their tail fanned out. 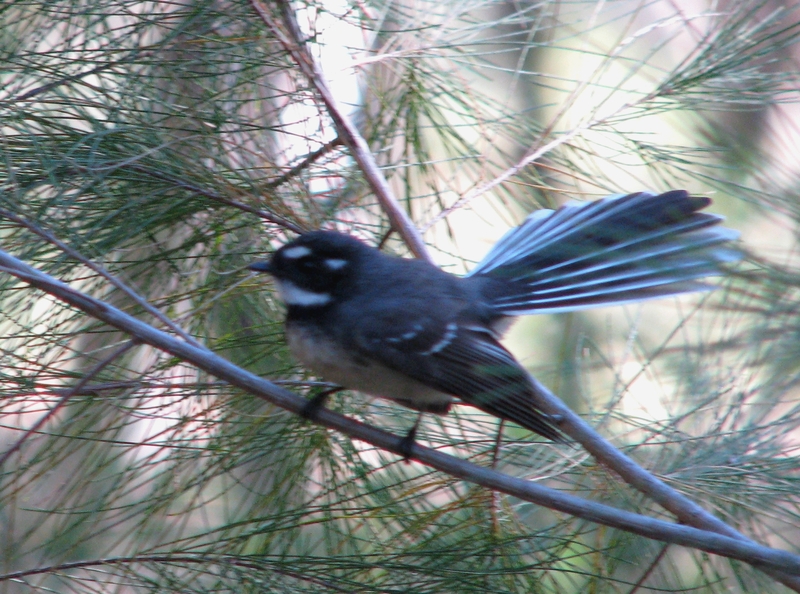 Grey Fantails are not shy, sometimes following walkers in the bush to catch insects disturbed by their passage. Only sixteen centimeters including tail these aerial acrobats twist and turn chasing flying insects to feed on. July to January Grey Fantail parents build nest in a thin tree-fork, unusually between 2 and 5 metres from the ground. Fine grass bound together with large amounts of spider web to form a cup like a wine glass often with a long stem drawn out from the bottom. Both parents share nest-building, incubation of the eggs and feeding. 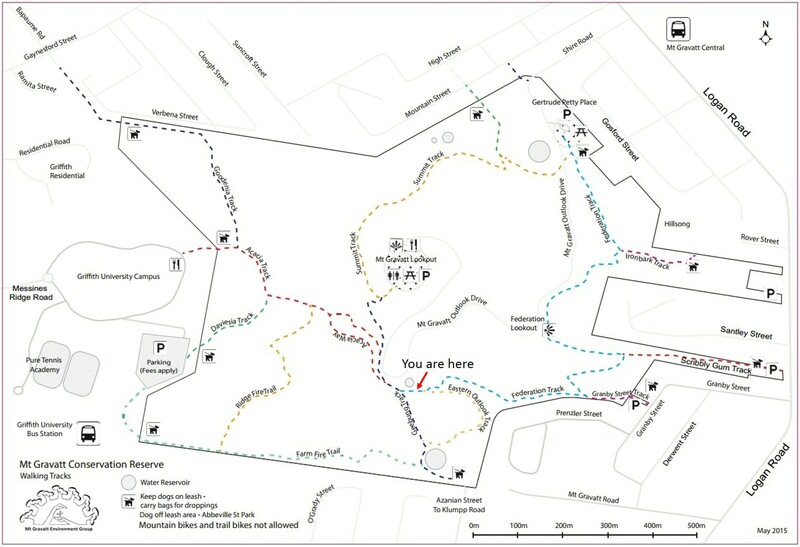 Good places to see Small Forest Birds are the timber bridge on the Federation Track and the shrubby area where tracks join on Acacia Way. 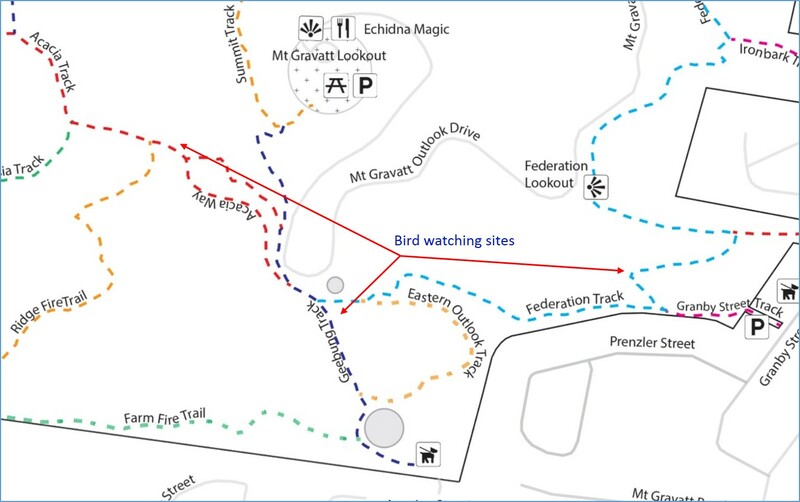 Restoration work will create Small Forest Bird habitat at the junction of Geebung and Federation Tracks, near the green water reservoir. 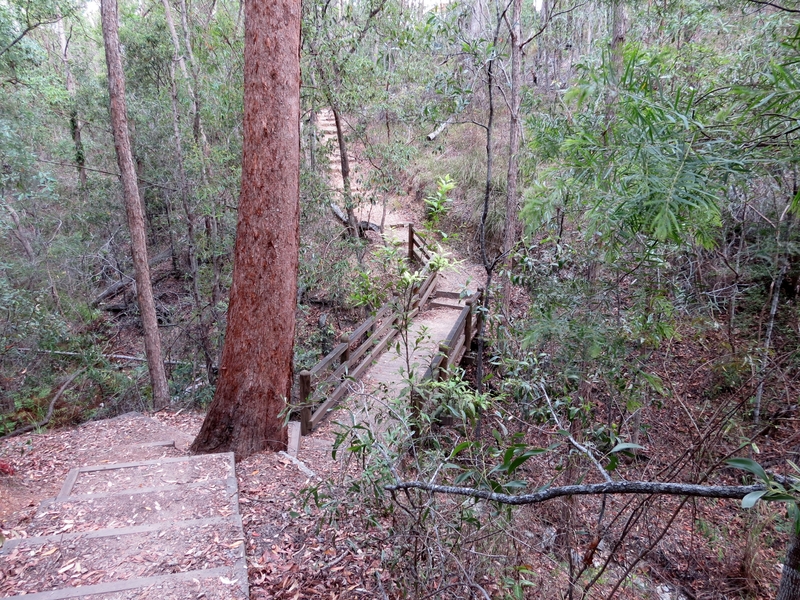 Stop for a break on the timber bridge crossing Jo’s Creek on the Federation Track. The gully with its thicker vegetation attracts a wider diversity of small birds.